The first method is known in the trade as 'Toothing-in' or 'Toothing-out'. 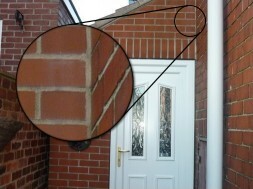 This method involves hacking away every other brick in the main building at the point you want to join the extension wall to and then make a seamless connection from the main building with the house extension. For this to be possible, the builder needs to build with the exact brick size and for the bricks to be perfectly aligned with the existing building when constructing the extension. This is slightly more expensive to achieve simply because it adds additional labour time to the build. The second method is using a Furfix Wall Starter. 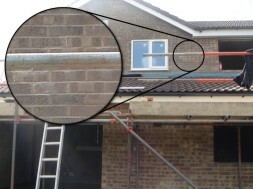 Furfix Wall Starter is basically like a crocodile clip attaching the main house to the extension. Furfix Wall Starter is added for every three rows of bricks. The draw back of this method is that it leaves an tell tale mortar line (See photograph on right) between the two buildings and can often under certain circumstances look unsightly. If the location of the drains permits, a drain pipe is often strategically placed between the two buildings as to hide the mortar joint. Customers choosing Furfix Wall Starter over Toothing-in method is often down to budget.